Luster for Zirconia Adjusting and Polishing Kits contain re-usable burs indicated specifically for use on monolithic zirconia restorations. The LUS91 intra-oral kit includes three friction-grip diamonds and blue and brown latch-type polishers in cup and point shapes. The LUS85 extra-oral kit includes an adjustment wheel and point, with blue and brown polishers in wheel and point shapes for use in a straight handpiece. The polishers in both kits are a two-step diamond impregnated system and are organized in autoclavable anodized aluminum bur blocks. Luster for Zirconia was evaluated by 14 consultants in 346 uses. 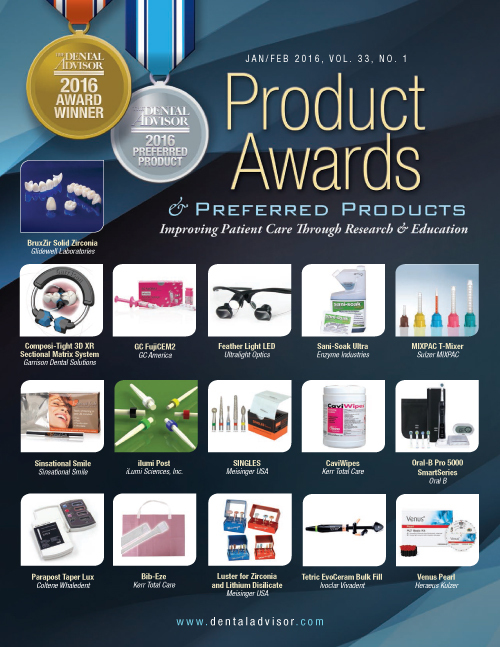 These zirconia polishing kits received a 91% clinical rating. Luster for Zirconia kits contain everything needed for adjusting and polishing zirconia restorations. Adjustment burs produced a smooth surface, and polishing in two steps was quick. A high gloss was achieved. Light pressure, especially with the first polisher, improved durability. Packaging in the metal bur block keeps the items together, and the entire set can be sterilized. Twenty-two percent of consultants reported that Luster for Zirconia was better than the polishing kit they were using and 64% reported it was equivalent. 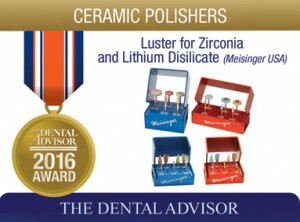 Sixty-five percent of consultants would switch to Luster for Zirconia and 86% would recommend it.  Use light pressure and water spray intraorally.